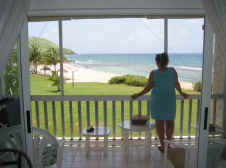 At Caribbean Breeze on St. Croix, USVI, there is an endless number of activities and attractions nearby. enjoying the incredible view, you will find something to suit your every desire at this Virgin Islands condo for rent. We offer our guests a "High Speed Internet Connection" at no additional cost! Don't wait too long to make your reservation...airline seats book up quickly for the holidays! A 12.5% USVI accommodations tax is additional. $500 refundable security deposit required. No smoking, of any kind, inside the condo. Check in 4pm, check out 11am. Rentals are generally Saturday - Saturday (Some exceptions may apply). There is a 10% surcharge for Easter and Spring break weeks. Additional maid service is available for an additional charge. Click the button below to book your stay online using our secure server. To avoid losing your desired dates...book online now! Click here for Special Sales! We can suggest a chef, a masseuse, a limousine, provisioning, babysitting and additional maid service. Just ask and we will do whatever we can to help you! Additional charges apply, you will work directly with each company. of this website. If you see any errors, bad links or any information that is out of date or incorrect please contact our webmaster. Thank you!